Impulse buys happen when I procrastinate. I've just started working on an enormous major essay (3500 words, due in less than a week! ); the end is no where in sight, but nothing raises my spirits quite like retail therapy. 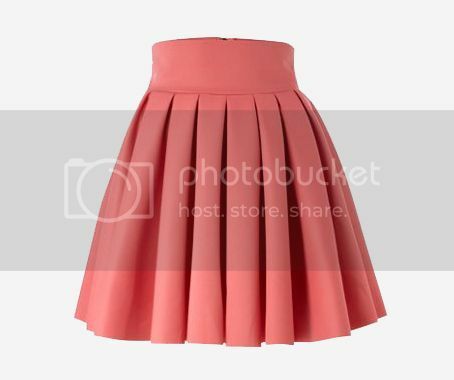 I had actually been looking for a-line skirts; they're a bit more adult compared to the fuller and flouncier options, but I'm pretty sure I'll always have a soft spot for princess-y fifties-inspired skirts (this is one of my absolute favorites!). This is also evidence of another problem that I have: I buy pretty much all of my clothes out of season. I started stockpiling a collection thick sweaters and cardigans at the beginning of the year in the midst of 30-degree summer days; in fall, I bought breezy tops, short shorts, and sandals; and now...this skirt. It's probably not completely appropriate to wear in winter, but it never gets too cold here, so I think I can make it work with cute tights and mary-janes.